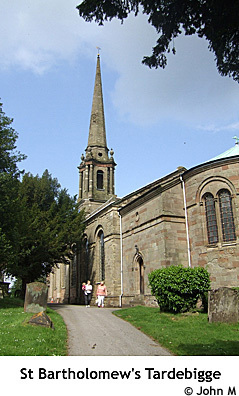 There are records of a Saxon church in 974 A.D., the name Tardebigge means 'tower on the hill'. The tower of a Norman church which replaced it in the 11th century collapsed in 1775 and the present building, except the chancel, was completed in 1777. The Cookes memorial survives from the Norman church. St Bartholomew's Church is on a hill overlooking the Worcester and Birmingham Canal which extends 30 miles from Gas Street Basin in Birmingham to Diglis Basin in Worcester. The canal is level from Birmingham to Tardebigge New Wharf situated below the church, then it descends by 58 locks to the River Severn. The series of 30 locks from the New Wharf to Stoke Prior (known as the Tardebigge Flight) is the largest concentration of narrow locks in the country. Of the five tunnels on the canal, two lie within the parish, Shortwood Tunnel (613 yards long) and Tardebigge Tunnel (580 yards long). Between the two tunnels lies Tardebigge Old Wharf, now the location of a boat-hire business. The Cistercian monastery of Bordesley was founded by Waleran de Beaumont between 1138 & 1140 in the clayland of north-east Worcestershire (& now on the outskirts of Redditch). Bordesley came under Tardebigge. TARDEBIGGE : Christenings 1813-57, Marriages 1837-1908, Burials 1813-67 [Microfilm.] Published Salt Lake City : Genealogical Society of Utah, Nd. A short history of St. Bartholomew's church Tardebigge Published 1977 Author Harris, David R Edition 1990 reprint of 1977 vol. Source D: N Wells. TARDEBIGG, a parish partly in the Alcester division of the hundred of BARLICHWAY, county of WARWICK, but chiefly in the upper division of the hundred of HALFSHIRE, county of WORCESTER, 3 miles (E.S.E.) from Bromsgrove, containing, with the hamlets of Bentley, Redditch, Tutnal with Cobley, and Wibheatb-Yields, 3458 inhabitants. The living is a vicarage, in the archdeaconry and diocese of Worcester, rated in the king's books at £8, and in the patronage of the Earl of Plymouth. The church is dedicated to St. Bartholomew. At Redditch, in this parish, is a manufacture of needles and fish-hooks. The Birmingham and Worcester canal passes through a short tunnel in the parish. BORDESLEY, a hamlet in that part of the parish of TARDEBIGG which is in the upper division of the hundred of HALFSHIRE, county of WORCESTER, 5½ miles (E. S. E.) from Bromsgrove. The population is returned with the parish. A Cistercian abbey, in honour of the Blessed Virgin Mary, was built in 1138, by the Empress Matilda, the revenue of which, a short time previously to the dissolution, was estimated at £392. 8. 6.: the chapel, dedicated to St. Stephen, which subsisted for some time afterwards, formed part of it.